While the activity or task is interpreted and later performed it’s important that the employee get as much performance support and usable tools as possible, just in time, as well as getting an overall support by the organization. The latter is where the Kirkpatrick’s organizational Drivers come to play. Instead of demanding that all employees must take a certain mandatory course the organization could choose to provide with guidance, support, encouragement and tools to interpret and perform the work activities correctly. In these stages of doing (interpreting + actually performing) it is also important that you evaluate the work and the results themselves. Was the activity correctly interpreted? Could it be performed correctly and within the timeframe? Was the end-result what we wanted? All of these are stated within – and compared to – the Leading Indicators (also a Kirkpatrick term by the way). When the performed work and its result are evaluated and measured this forms the basis of the reflection stage, which is where learning is extracted from work (Charles Jennings words). The learning from this is shared with colleagues and perhaps with those in charge of education. 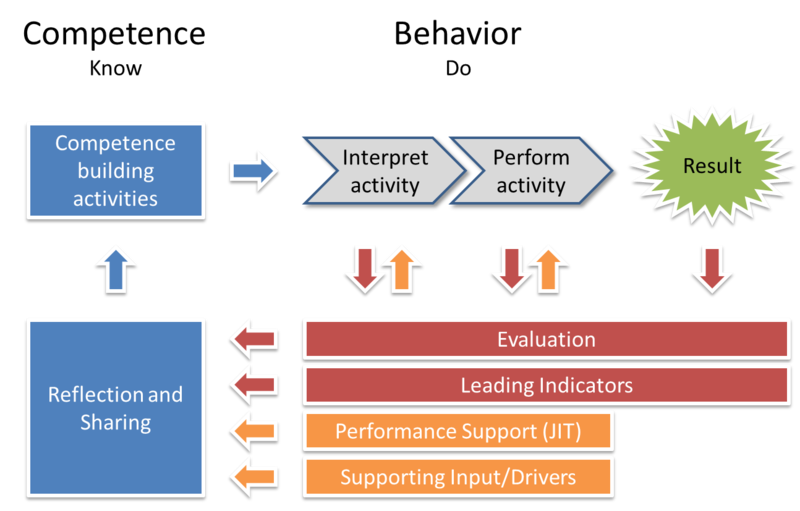 The reflection also needs the analysis of how the performance support tools worked (was the database complete?) and if the organizational drivers helped at all (did your manager support you?). The learning from the latter is shared with the Knowledge & Performance team to create and/or update new tools and support. This isn’t rocket science by any means at all. It’s all about the fact that we shouldn’t add learning to work but more of extracting learning from work. However, we must lift our gazes from the training/learning swamp and start getting with the program of actually getting things done. It doesn’t matter if all of the learning is formal, informal or abnormal. If the critical behavior isn’t present – no result will ever come of the performance campaign. I “left” the area of learning this spring. It was a reflective process where the words of Jennings – extracting learning from work – was one key influence. What became a truth for me is that learning is embedded in reflection upon work and where reflection is an inevitability consequence of sharing opinions about work and as well caring about your co-workers views. When reflection is present it is never possible not to learn. When caring and sharing are present it is never possible not to reflect. Though, when discussing competence building activities, before and or after doing (working), reflection and learning become externalized from work, not internalized. And when competence building activities become a responsibility for someone else not actually doing the work, this externalizing gets reinforced. I draw a parallel to the marxist term alienation “which describes the separation of things that naturally belong together; and the placement of antagonism between things that are properly in harmony” (quote from En Wikipedia), as well as a parallel to Taylorism. From these parallels you understand that I disagree on dragging things apart which naturally belong to each other, which working, reflection and learning are. From these parallels you also understand that I disagree on having specialist departments in the area of learning and performance. Departments have the tendency to protect their legitimacy and to become bureaucracies, which moreover do not often resigns, instead they want to expand. And in the longer run, they may become counterproductive. Instead sharing, caring, reflection, learning must be regarded as work, done by workers. And supported by workers which has a special talent for facilitating sharing, caring, reflection and learning among workers. It should never be externalized, it should always be internalized. You are absolutely right in what you’re saying Niklas. These things shouldn’t be pulled apart but even more together. The model shows the flow and to do that they have been pulled apart for illustrative purposes only. Your comment and my reply makes that clear however so I appreciate your respons! In regard of your more organizational comment I agree with you there as well. I also suspect my answer will be the same. Organizations creates roles and departments to make sure they work together in a clear way. If they only had one big department with people being allowed to do whatever they wanted, even if they had the capacity to do that, things would be much more unclear for the employees. One needs to be constrained to be creative and constructive! Hi again Henrik. Only looking at the model I could agree on the illustrative purpose. But in the text which I also read, departments are mentioned and in reality as well, they exist. I do not argue for a one-department companies. But in almost any organizational chart you can observe, specialist staff-functions are at the top, often as departments. This can naively be regarded just as an illustrative purpose but should also be regarded as character of power, status and influence. Which also could be read as the chain of command, and if so, a typical massmedial type of organization. Which then, maybe conspiratory, could be interpreted as that the L&D-departments says how the work should be done, instead of assisting workers to perform better. If such organizational charts are turned upside down I think the illustrative trick could influence specialist to regard the chain of assist and service. Neither do I argue for companies where employees do whatever they want. Order is not dependent upon managers which you can read about in f ex Gary Hamel excellent article “First, Let’s Fire All the Managers” http://hbr.org/2011/12/first-lets-fire-all-the-managers. You can also review my opinions on this subject if you search for Hamel on Palorials blog (in Swedish though), http://www.palorial.com/sv/?s=hamel&submit=S%C3%B6k&lang=sv. A lot of “could be”s and “if”s there Niklas, but I do agree on what you’re saying even though that’s besides the main point of this post. My focus and main audience for this blog is other people working with L&D and to get them to realize that our kind of department doesn’t exist in a vacuum but must be heavily involved in the other departments. My main point was that getting people to do things correct involves more than one department. In organizations that have more than one department that is. This also mean that the individual must take responsibility for her own learning and performance. In my mind that doesn’t render a Learning & Performance department void at all.